Will UC Berkeley students go to the polls today? The vast majority probably will not, if a recent poll by the Public Religion Research Institute and The Atlantic on young adult voting patterns holds true for this campus. Only 28 percent of those polled were “absolutely certain” that they would vote this year, compared to 74 percent of seniors. Although the Free Speech Movement at Berkeley was not about voting rights, it was fueled by that struggle. In the summer of 1964, more than 700 Northern students had gone to Mississippi to register Black voters. One of those students who went to Mississippi was UC Berkeley junior Mario Savio. Up to that time, only a handful of Black citizens had been allowed to register despite making up almost half of Mississippi’s population. Their signing up often had tragic consequences. In May 1955, the Rev. George Lee had managed to register in Humphreys County in Mississippi; he used his pulpit and printing press to urge others to do so. White officials offered him protection on the condition that he end his voter registration efforts, but Lee refused. He was murdered shortly thereafter. In 1961, Herbert Lee, who was working with civil rights leader Bob Moses to register Black voters, was killed by a state legislator who claimed self-defense and was never arrested. Add Lamar Smith and Louis Allen to the dead, and add the many more who were beaten, fired from their jobs, thrown off the land that they were sharecropping or had their homes shot up or firebombed for trying to register. In June 1964, James Chaney, Andrew Goodman and Michael Schwerner, two civil rights workers (one Black, one white) and one of the summer volunteers, were arrested by a deputy sheriff and released into the hands of Ku Klux Klansmen, who shot them and buried their bodies in an earthen dam.The search for the three missing young people and the grisly discovery dominated the news that summer. When Savio returned to Berkeley in the fall of 1964, eager to continue the struggle for civil rights, he and other student activists were told that they could not use the Bancroft strip, the little piece of land at Bancroft Way and Telegraph Avenue — or any place else on this campus — to support voter registration in Mississippi or any civil rights activities, whether in the South or in Berkeley. They wouldn’t be allowed to raise money, recruit members or advocate on behalf of any other political or societal concern. In response, students formed the Free Speech Movement. We fought the ban with civil disobedience, direct action and eventually were able to get it overturned. 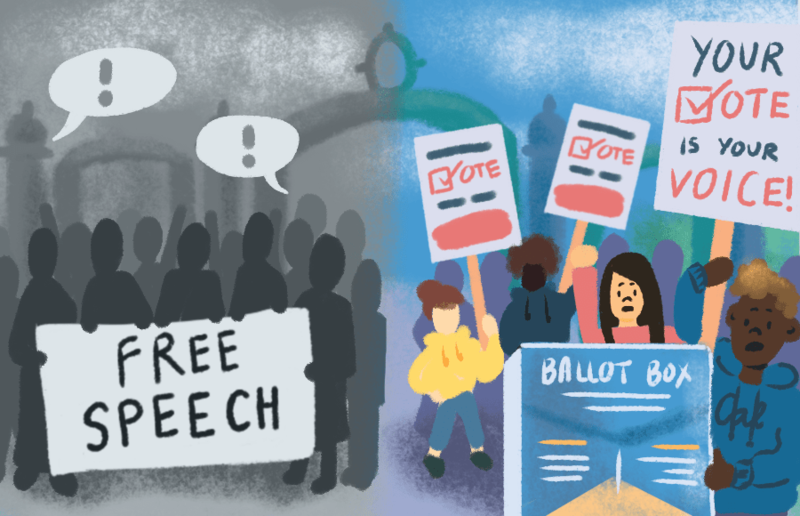 The UC Board of Regents agreed to abide by the Constitution of the United States and allow free speech and its associated activities to take place on campus. There were many leaders in that struggle; Savio’s moral clarity and eloquence led him to become the most famous. He often told a story about an experience he had registering voters there, recounted in “Freedom’s Orator: Mario Savio and the Radical Legacy of the 1960s” by Robert Cohen. Savio had persuaded an elderly Black farmer to try to register; the farmer, politely holding his hat, stood in the registrar’s office, waiting for the attention of the registrar, the sheriff’s wife. For, what seemed to Savio, an excruciatingly long time, the registrar pretended not to understand the man’s request to “redish” to vote, trying to humiliate him by ridiculing his use of the local dialect, treating him, as Savio saw it, as “worse than a dog.” But the farmer stood his ground and finally got a registration form. Mario felt his life had been changed by the act of witnessing the farmer’s courage. But voting rights violations did not end in 1964. In Georgia, a couple of weeks ago, local officials stopped a busload of Black senior citizens from going to the polls for early voting; they claimed that taking citizens to the polls constituted illegal “political activity” at a county-run event. In North Dakota, the legislature has passed a law requiring street addresses in order to vote; many Native Americans on the reservation have only P.O. boxes, not street address. In Dodge City, Kansas, a city with a majority Latinx population, there is only one polling place, which was moved outside of town, more than a mile away from the nearest bus stop. New Hampshire is requiring college students to become permanent residents of the state if they want to vote in their college communities. The Georgia secretary of state put 53,000 voter registration applications on hold because they failed to meet the state’s “exact match” law because of trivial differences (such as hyphens) between applicants driver’s license records and their registration forms. Nearly 70 percent of those applications are from Black voters. Odds are that no one humiliated you when you registered to vote! No one will kick you out of college or fire you from your job or throw out your mail ballot because you didn’t dot your i’s. No one will murder you as you walk to the polls on Election Day. Please don’t relinquish — out of apathy, defeatism or sheer laziness — what people have struggled and died for and continue to have to struggle for, across the globe and in our own country. And if that doesn’t motivate you, consider what’s in it for you: Voters are more likely to have higher incomes later in life, fewer symptoms of depression and a lower risk of death than those who don’t vote. Plus, voting will make you feel virtuous — I guarantee it! Vote on Election Day. Lynne Hollander was a member of the executive committee of the Free Speech Movement and an arrestee in the Sproul Hall Sit-in; she is the widow of Mario Savio.